A little episode from some years back recently resurfaced and has stuck in my mind as relevant for some reason I haven’t quite been able to figure out. It can be tough to be a born and bred English Major, where you more or less do believe in symbols like the ones authors like Nathaniel Hawthorne plants in brambles on the literary roadside to foreshadow a fall from grace or a connection with the divine. It can leave me deciphering events from time to time, mining for clues. This particular event occurred some time during the year I turned thirty, a year which was remarkable for the fact that I had to attend six weddings in six months – three of them as bridesmaids, with one happening on my 30th birthday itself – and I was accepted into the Writers Guild of America, west. This was a big deal for me, and I hoped it was a signpost of a career that would thrive as a dream come true. (So far, my overnight success as a screenwriter is about 25 years in the making, but I am still hopeful.) The WGA is a classy outfit. They charge a lot for dues, but when they have an event, it is well organized and the food is nice and plentiful. They had a reception for new members and I enthusiastically drove over to the mid-Wilshire neighborhood of LA to attend it. Once there, standing in a room full of strangers I felt a bit shy and awkward, grappling with the ice breaker question that seemed to start every new conversation, the equivalent of “what are you in for?” that inmates ask each other in prison movies. The most common ways that people are admitted to the guild is through a sale of a script to a company that is a signatory to the guild (in other words, a proper production company or studio, and not ‘Larry’s Pretty Good Movies and Discount Lawn Furniture, Inc.’); through getting a staff position on a television show; or being hired for a writing assignment by a signatory company. I got in under this last condition, and most of the people I was mingling among at the reception were newly hired staff on TV shows. They had salaried jobs writing for a living, I had a project with an uncertain future and I was still a writer’s assistant to a highly regarded feature film writer and it was through him and his supervision on a studio assignment that had gotten me the gig. I looked at him in shocked silence for a moment. “The Greeks didn’t think so,” I blurted out, unable to screen out a tone of reproach. Startled, he looked up and I could see him accessing that internal screen in his mind. It seemed he did know about Oedipus Rex, Medea, the Oresteia trilogy and the knowledge that just about every Greek tragedy that launched Western Civilization’s ongoing love affair with the dramatic arts is built around the study of the consequences of human pride. This info and appreciation for the Greeks had been hardwired into me since I was a Junior in high school and only deepened in college. “Oh yeah!” he said and, if memory serves, he shortly afterward skittered off to find a set of Aeschylus’ Cliff Notes. Happy to help, I thought ruefully to myself. I wasn’t sure what the hook was to that story then, and I’m not sure now. Is it about dissatisfaction being a form of laziness and lack of imagination or do we humans go through a lot of life missing the obvious? Is it about answering back to those people who asked me derisively through my early years, “what are you going to do with an English major?” Or is it a tweak to remind me that I am dangerously on the brink of hubris about something or other? I think it may be as simple as a reminder to appreciate the Greeks. I actually think the story has popped up because I’ve started eating Greek yogurt and I feel like we owe the troubled Greek nation something for all they’ve done for civilization over the millenia. What if we agreed to give Greece a royalty for this latest food fad? Like, sent them a nickel for every Hellenic yogurt that’s purchased and consumed in this country. Even two or three cents a cup could be huge for them, right? And so deserved. For this high protein stuff has revitalized people’s interest in yogurt and healthier breakfast choices on the scale that J.K. Rowling revitalized kids’ interest in reading. She got rich from that, why shouldn’t Greece? Those Greeks. They understood everything. From the metaphors they developed around always messing up and misremembering directions and warnings you’re given in advance (The Oracle of Delphi!) to passing into new life stages across rivers of forgetfulness like the Styx and Lethe and Nepenthe, they were a creative, purposeful, thinking group that really got how people tick, and even how popular culture works. Larger than life human-like deities with special superpowers, mingling and meddling with mortals? They covered that too – and got the word out before TV and twitter. I definitely came late to the Greek yogurt party, and I’m still not sure that I love it. It’s just that all the other natural yogurt options keep deteriorating or disappearing – like Dannon’s coffee yogurt – and people are pushing the Greek stuff as higher in protein and therefore more nutritionally dense as a good dairy/breakfast protein choice. I really hate the taste of artificially sweetened yogurts and I won’t buy yogurts that don’t have live cultures either. So it seems that I am fated to learn what words like OIKOS and CHOBANI mean, as that is where the brain trust seems to be at this moment in time. I have tried Fage and Chobani and Dannon’s ‘Oikos’ brands and still have to try Stonyfield’s ‘Oikos’ and Trader Joes before I can weigh in on an opinion. At the moment Fage is in the lead for me, but of course that is the priciest on on the shelf. Dannon’s Greek yogurt is being heavily promoted in Safeway these days, with an ongoing 10 for $10 pricing, but while it says it contains live cultures, none are listed on the ingredient list as they traditionally had been with Dannon’s ‘fruit on the bottom’ style and the coffee and vanilla varieties. (Dannon’s Light and Fit brand is flavored with aspartame or some other fake sweetener that has alienated me.) I had a really nice Chobani flavor that I haven’t been able to find in the stores, and while I like their consistency and all, the pomegranite was weird – real pomegranite seeds in every bite! – and their blood orange flavor made me wonder if they’d ever tasted a blood orange. So while my editor will question the structural integrity of this piece (and he is right to do so!) I’m going to meander toward my conclusion by way of a stadium in London where ‘Brittania’ celebrated its national accomplishments for the global telecast of the opening ceremonies of the Olympics (oooh! another Greek tie-in!) I’d like to tell you that I’d planned it all along but I cannot tell a lie. 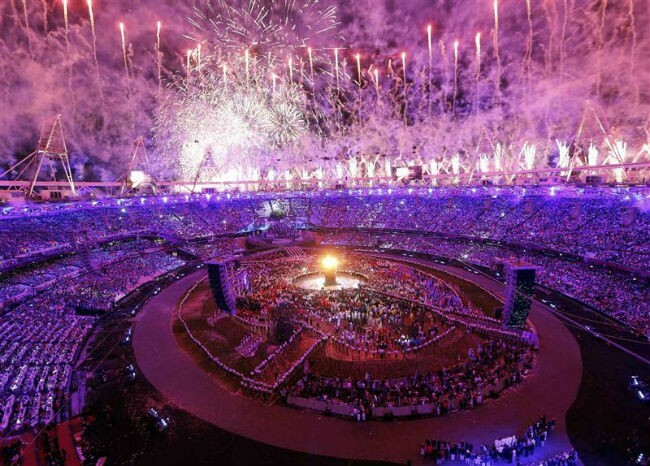 It hadn’t occurred to me as I was working on this post earlier in the week to include a paean to the Olympics at all. But as long as the shoe fits, insert your own paean here. And yeah, it’s another Greek word we still use, look out I’m on a roll. I’ve already asserted above that I identify as an English major and am an Anglophile absolutely. But I must say that seeing the initials N H S (for National Health Service!) emblazoned center stage as dancers bounced on mattresses and building to a grand finale where the cast of thousands evaporated to make a final to nod to a man at his desk because he is the mortal who allegedly came up with the internet really amused me. I know they celebrated a lot of other worthwhile UK contributions too, like corgis and James Bond, but it made me wonder what I’d include if I were creatively behind a similar pageant of accomplishments if we were hosting in the United States. The first thing that jumped to mind was a little ‘banned substances’ segment, starting with Prohibition and ending with Big Gulp sodas interdiction chase on the streets of New York. Can’t you picture it? It’s got noir, it’s got flappers and gangsters, it could even do a bit of an ‘80’s style number with Just Say No to Drugs that could have a Nancy Reagan as Dorothy from Wizard of Oz in a kind of allegorical odyssey. Actually, I think the late Kevin Kesey did something like that already and it was called Twister. Bear with me, I’m just brainstorming here. All that to say, I am looking forward to the beginning of the Olympics and all it represents, and I’d like to just take this moment to remind us that we can always – either individually or as nations – stand to be reminded that while pride in our accomplishments is a great and worthy thing, don’t over do it. You know how they say pride goeth before a fall and, worse case scenario, the eye you put out could be your own. I’m a wee bit smitten by Stevia these days, especially ones from South America (no bitter aftertaste) and even the ones that are cut by a noncaloric sugar alcohol so you can use it nearly spoonful by spoonful. I’m starting to try out a fgew recipes with it to see how it bakes up – but so far, so good! I’ll have to try it. Thanks for the reccommendation!